There’s beginning to be quite a buzz around Mitch Trubisky. It’s been almost a month since the draft. The Bears were bashed nationally, with some clowns even calling for Ryan Pace’s job. But more evidence is pouring in and they’ve even played a little football. So far, the early returns are that Trubisky is better than he was sold to be before the Bears made the pick. It’s often been said that teams never really know what they have in quarterbacks until they get them in their doors. The early returns are promising. The Bears wanted Trubisky to feel the stress of being an NFL quarterback. They wanted him to feel the weight of the expectations they have for him. They purposely tried to put too much on his shoulders in the rookie minicamp. The problem is they couldn’t. One of my very few NFL sources is close to the Bears coaching staff and he said they came away impressed. He was able to soak in everything they threw at him. He absolutely aced his first NFL test. It wasn’t just the Bears coaching staff that was impressed. You can hear the two best Bears beat guys, Hoge and Jahns, rave about his arm strength and accuracy. Even the Tribune’s Brad Biggs and Rich Campbell didn’t bash him, which means he must’ve been great. We don’t know if Trubisky can take NFL hits and keep coming. We don’t know how he’ll handle pressure or how he’ll handle adversity. We have no idea how he’ll respond to NFL speed. We won’t know that for a while. But since the draft some people have come forward with information that should help Bears fans feel better. I don’t know what to do with those quotes because I don’t know who is making those statements. But here’s what I do know: Two teams with decision makers who have hit big on quarterbacks wanted to mortgage the future of their franchises to get Trubisky. Peter King gave us a lot of great nuggets that he found out from the 49ers draft room. One was that Kansas City had a trade worked out to move up to the fifth pick. But once Trubisky was off the board, so was that trade offer. Why is this important? Look at the history of Kansas City’s decision makers when it comes to quarterbacks. Here’s a quick list of QBs GM John Dorsey and coach Andy Reid have been involved in acquiring: Brett Favre, Mark Brunell, Donovan McNabb and Aaron Rodgers. Drafting quarterbacks is a crapshoot, but those guys have been pretty good at it and they are convinced that Trubisky is going to be great. To make that move, the Saints would’ve had to give up the 11th pick, the 32nd pick, their first round pick next year and probably another high pick. Let’s also keep in mind that the Saints were planning on drafting Patrick Mahomes if he was there at 11. In other words: There’s no way in Hell Sean Payton wasn’t trying to get a quarterback. And that quarterback was Trubisky. This could all be meaningless. 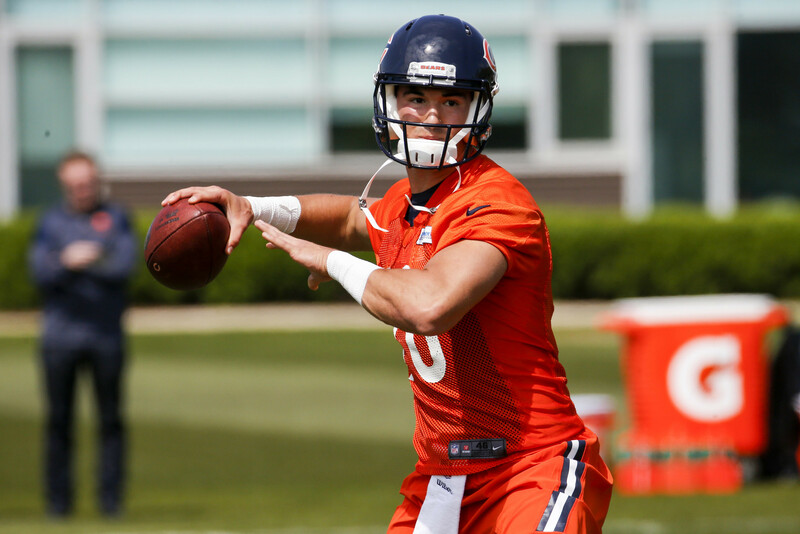 Nobody knows if Trubisky can play until he does. But the evidence we have so far suggests the Bears just might have found their guy.